Director who is famous for his well known block buster films James Cameron is soon planning to dive in a specially designed submarine to the Mariana Trench in the Pacific Ocean. He is planning to explore under sea life at a depth of 8.2km. Its really a great stunt you can say. This is for those who are ready to risk heavy risk. The pilot of this submarine will be bolted inside the submarine made up of think steel to with stand the heavy pressure under the water. It make take around 2 hours to reach the bottom. 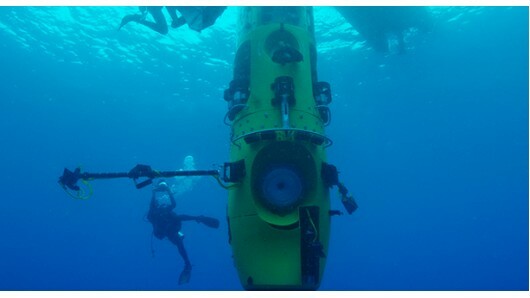 The submarine is equipped with mechanical arm to collect few species. The creatures underneath will not be having bones because its difficult to creatures with bones to survive under high pressure. This dive is very special for explorers because, no human has attempted such a dive since 1960.Fore more details check out this video.